Ultimate Doom is one of those games that has it’s place in gaming history. Many gamers know about Ultimate Doom and what it’s about. If you don’t know then you are most likely one of the newer gamers. 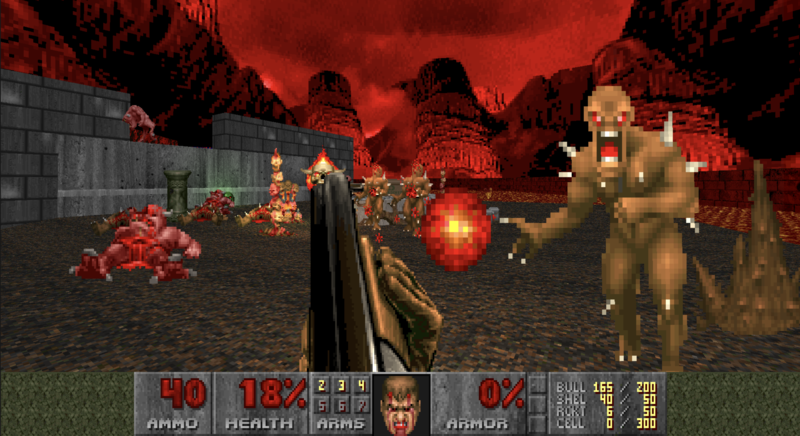 In Ultimate Doom you run around, kill demons, open doors, kill demons, find keys, kill demons, find new weapons, kill demons and get to the next level, while killing demons. Understand yet? 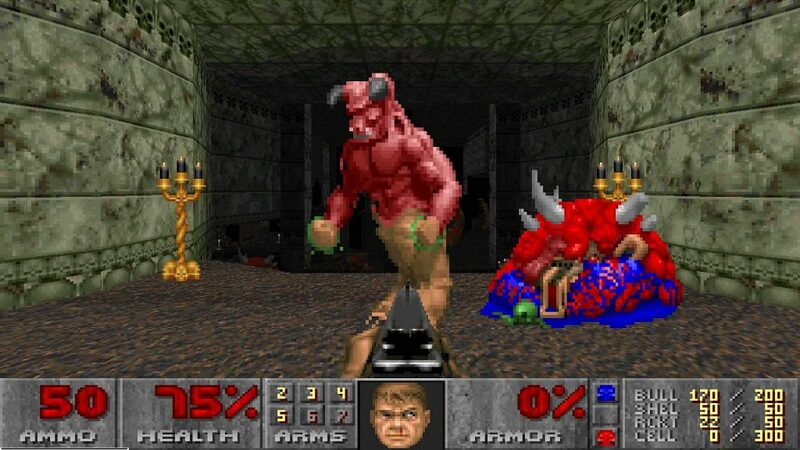 Players control a character called Doom Guy who later go on to learn that he’s called the Slayer (We wonder why). 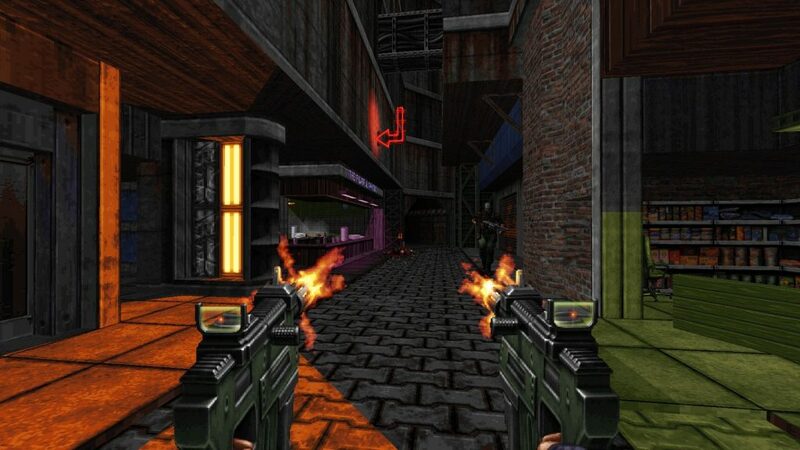 You start the game with a pistol which was typical of first person shooter games back then. Your first enemies where zombie men who were weak and never a problem. Ultimate Doom goes easy on you for the first level but does a good job at showing players what this whole game is about. You move fast, enemies tend to always be in groups, you must find items and ammo and there are secrets in the levels. Finding the secret location in the first level will reward you with a rocket launcher. Many players have accidentally killed themselves with the rocket launcher (admit it, don’t be ashamed). Eventually everything goes from “hey not too rough” to “hurt me plenty” real quick. Before you know it the levels feel like “Ultra-violence”. Why? Because there are so many enemies, traps that can result in your death, many secrets you missed and a whole abundance of projectiles coming straight at your face (can’t you sit still in your seat?). So how do you survive? It’s easy… keep moving and move fast! 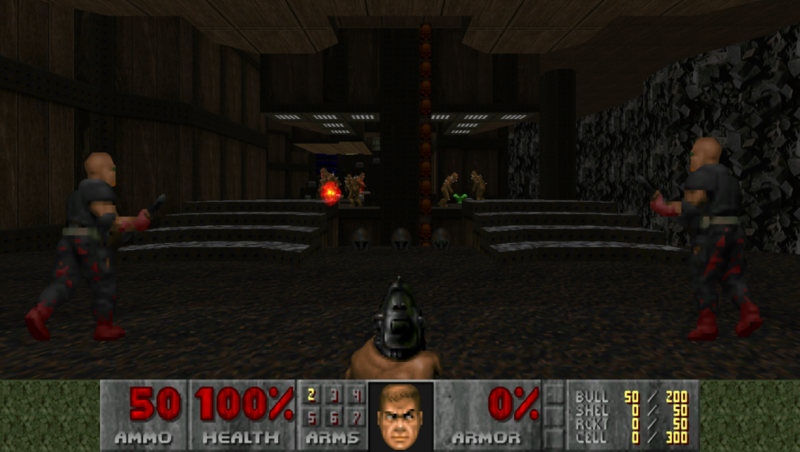 In Ultimate Doom, Doom Guy (you) have unlimited stamina and run really fast. You can even outrun your own rockets. Move around, aim well and take them all down before they get you, then find those medkits and stay topped up. Many players including us enjoyed this. There were a variety of weapons. many levels, many different vicious enemies, surprises in each level and things got harder as you progressed. There was lots of colours, dead things everywhere and hazards. X35 Earthwalker, the legendary soldier himself played this game when he was very young. This game was fun. We remember getting the shotgun for the first time and really started dropping those enemies easy. The imps didn’t phase us at all as they were easier to deal with in most situations. We had to dodge those fire balls they threw. Maybe… just maybe… we leaned to get out of the way… sometimes… maybe. It wasn’t long before we ran into the stronger pinky demons who forced you to back off as they just rushed you down but with diagonal movement until they were near you. The zombie men with shotguns was the biggest threat at that point as they had good accuracy and their shots did big damage as a shotgun should. It gets worse. 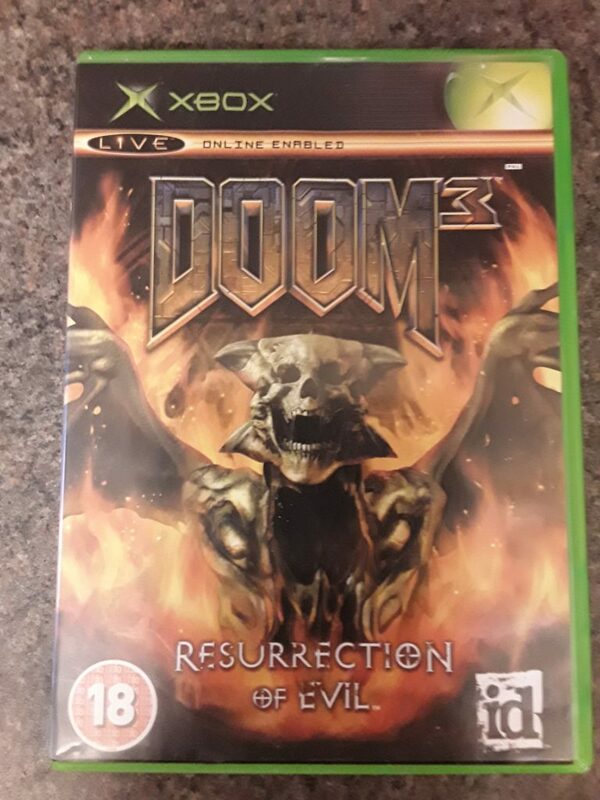 By the way we played Ultimate Doom through the game Doom 3 resurrection of evil as Ultimate Doom, DOOM 2 and the master levels were free features. Levels required you to search them completely to find keys, areas, switches and more to make your way through them. Some rooms had traps; for example, you enter a room and see the blue key you need. You grab it and then you hear many enemies. You then realised that a wall had opened up and enemies come out to say hello. Some times they were triggered by grabbing a certain weapon and some times they were triggered just for entering a room. Completing each level and seeing your completion percentage was cool but at times annoying as you always see the many secrets you missed. Today you can see whole gameplay guides showing where the secrets are. Ultimate Doom is Cleary not another shooter game. This game was really fun. The best thing about Ultimate Doom was that you can play with others. X35 Earthwalker, the one true Earthwalker also played through Ultimate Doom with family. It was funny simply because at first we stuck together making our way through the levels but later on ended up confidently splitting up to tackle different parts of the levels by ourselves which could get chaotic. When one enemy was chasing one of us, one of the family would keep walking behind that enemy as the enemies didn’t change target until they were attacked. We even lead that enemy around the map while two of us was walking behind it. When the levels got real big and dangerous we would all be in danger and since we were far away we will always here our soldiers get hurt, die or us literally calling to another to help. The memories are definitely good ones. One time one of us fell into lava and we watched their split screen to see if they can find the exit out. Spolier, they survived. The enemies have to be the most memorable thing about Ultimate Doom. Especially the bigger ones like the pinky demon, hell knight, baron of hell, Cacodemon and Spiderdemon. When you see them for the first time you don’t actually panic or get scared simply because all the enemies pretty much ave the same pattern. They always come towards you, normally have projectiles attacks so you have to dodge, can take a lot of damage and give a lot more. The first time encountering the Cyber Demon solo was a problem as those rockets seriously hurt and multiple times had to run away to find rocket ammo. one thing about Ultimate Doom is that if the game presents and gives you loads of ammo, weapons etc, you know it’s about to go down. Those side steps to dodge rockets and that Cyber Demon took forever to die. First time facing this demon with a team was a different story. We were running around it at full speed all launching rockets like we didn’t care. It was basically a big bug being surrounded and attacked by three hornets firing their advanced explosive stingers at it repeatedly without mercy. Ultimate Doom did have some interesting features that can help out. For example you have a map of the level. We actually never knew we had a map for the longest time. The maps weren’t always clear as it’s 2D while we play in 3D (yes we know Doom was a 2D game they made 3D through smart coding). So when you enter a room you see some recognisable parts but mainly use the map when you are either lost or completed the level but was searching around. The map was a good feature though. Another feature which was much cooler was the fact that the demons can turn on each other and fight amongst themselves. This can be done when you make sure a demon of a different kind gets hit by an attack from another. If they are different types of demons, there is a high chance they will turn and fight them instead. We got to see who would win in a fight of one Cacodemon vs five Imps or two hell knights vs a mixed group of imps, pinky demons and zombie men. If you play your cards right, you can sit back watch the fight and place your bets (gambling is bad and we don’t encourage it). 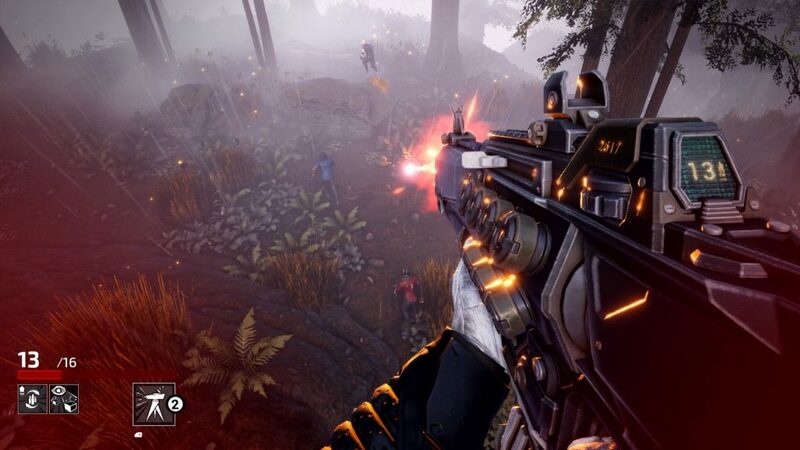 Deathgarden is a action first person shooter game developed by ‘Behaviour Digital‘. 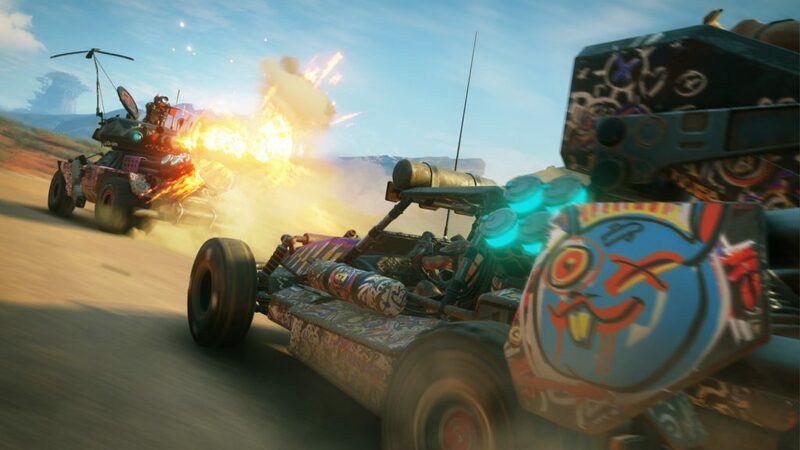 It is coming out in the first quarter of 2019 on the Xbox One, PS4 and PC. Sure there is early access for PC but we don’t really care about that. It’s the whole hunter vs hunted theme. We hope they do this one well. Let’s take a look. 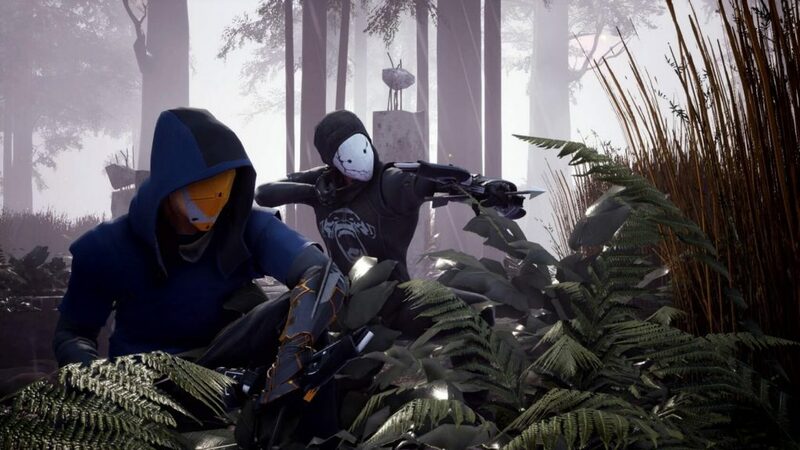 Deathgarden is set in the so called near future. 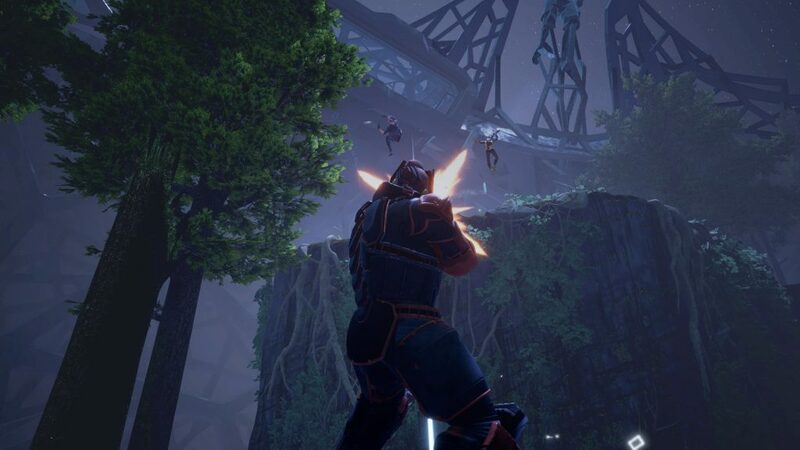 In the world of Deathgarden, the most popular sport in the world is actually a dangerous one where people can and do die. A powerful hunter must hunt down and kill a group of people called Runners. These people are willing participants in this. The Runners must hide, evade the hunter and escape the arena, the garden. Sounds fun right? We are sure normal (stupid) people would love to take part in this type of sport. The rules are quite simple. The Runners must avoid and the Hunter and escape from the garden while the Hunter hunts them down and kills them. There are objectives for the runners to complete which will open an exit for the them to escape through. The hunter isn’t going to let that happen though. Does this sound familiar? Well it should. remember Dead by Daylight? Yeah, that’s right sucker. There are three phases to every match so far. Phase one: the Runners are sent into the garden before the hunter. they can use this time to locate the objectives and mark them for the whole team to see and look for crates to upgrades their abilities. Then in some seconds, the Hunter comes in and things get real. Phase two is where the Runners must complete the objectives. There are two game modes: ‘Gather & Deliver’ and ‘Capture’. In Gather & Deliver the Runners must go to dispenser stations to gather keys which they must deliver to certain points in the garden. In Capture, Runners must stand in the designated areas for a period of time to capture it. All this is happening while the Hunter is chasing them down, shooting, shocking and trying to kill them. 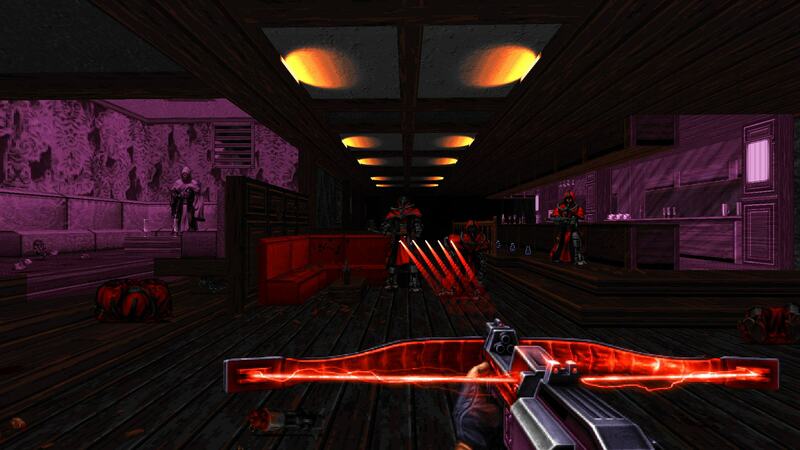 The last phase, if the Runners succeed in opening the exits by completing the objectives, is the blood mode. Now all runners are revealed and the Hunter can execute a downed Runner straight away. If the Hunter kills three runners, the runners lose. Sounds intense right? it is. The Hunter is powerful and too much for the runners in straight up combat. He has powers, dangerous weapons, abilities and some perks too. The hunter plays in first person and cannot be killed. He must stop the runners from escaping the garden by straight up find and killing them. Let’s go deeper though. 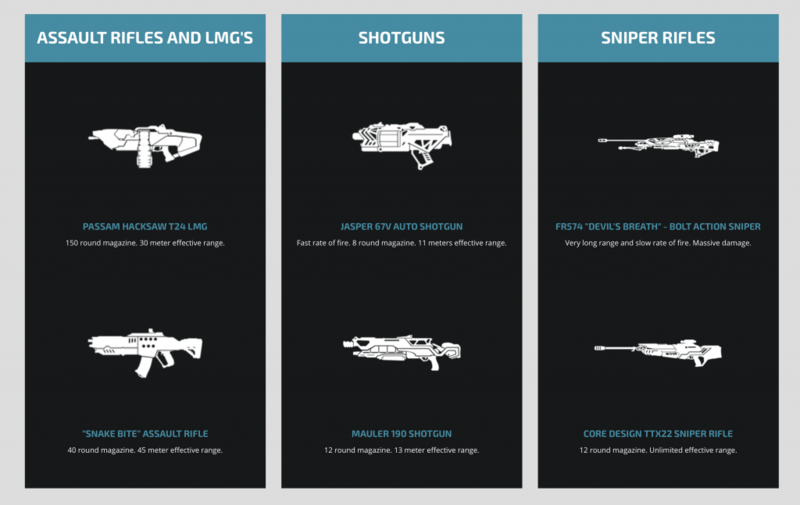 The hunters have different weapons to choose from: shotguns, LMGs, sniper rifles and assault rifles. For example the “FR574 Devil’s breathe – Bolt action sniper” has a slow rate of fire but very long range and deals large amounts of damage. The Passam Hacksaw T24 LMG has 150 rounds per magazine and has an effective range of 30 meters. The two permanent abilities of a hunter costs stamina upon use. They are Super Charge which increase movement speed and jump distance and the other is Stun which (you guessed it) stuns and deals small amounts of damage within a short range. Hunters can do more. There are four powers for Hunters to choose, only one, from. They are: I see you, Fade, Spawn Turret and Drop mine. I see you reveals all nearby runners for 11 seconds. Fade makes the Hunter invisible and he makes no sound, this also cure the hunter of all negative effects like slow for example. Spawn turret lets the hunter place up to two turrets which ca and will fire at any and all runners within the range of 40 meters. Drop mine allows the hunter to set up proximity mines, up to ten. The Deathgarden got a whole lot safer right. Finally the perks. Hunters can choose two always activated passive perks. For example you can have increased magazine size and have downed runners revealed to you for 6 seconds. There are more perks though. The Runners are agile and off course fast. They can also climb any surface too which is a much needed skill. They cannot kill the hunter but have equipment and devices that can halt, distract and harass the hunter. They play in third person and rely heavily on communication and teamwork. Let’s go deeper though. There are three runner classes: Torment are all about harassing the hunter, messing with him, debuffing and stopping him from messing with your team. Support who can heal and shield their allies from a safe distance. Control who are best at handling objectives and messing with the Hunters focus and actions. Each of their abilities have three tiers. For example the support has healing bolts that, at tier one, just heal allies, tier two has an increased radius, but at tier three can revive down allies. 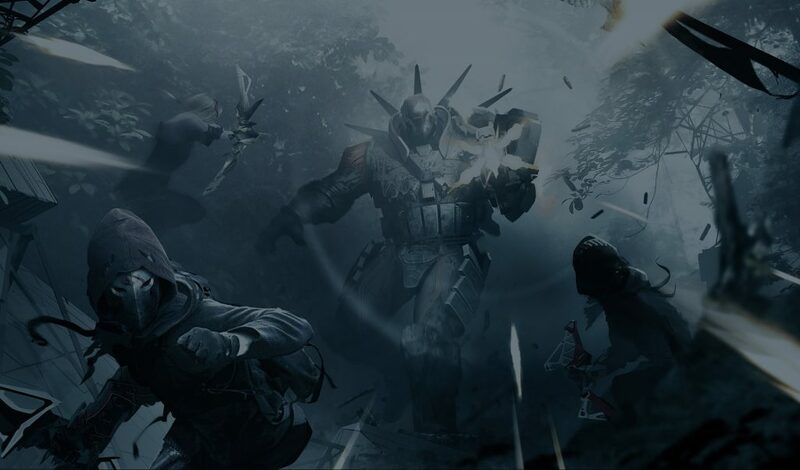 Another example is that the torment class has a blind ability which at tier 1 blinds the hunter, at tier two the radius is increased, at tier three the hunter’s weapon has maximum spread so basically blind and little accuracy. Runners also have perks. More available perks than the hunter. Like with the Hunter Runners can pick two of them. For example you can have ‘revivalist’ which lets you revive with full health instead of the standard 1/3 and ‘Damage Dodger’ which reduces damage you take by 40% while evading. Or you can combine ‘Lucky Charm’ which gives a 25% chance to receive an additional weapon upgrade part from a crate and ‘Quick Rescue’ which increases rescuing speed by 50%.So get creative, communicate with your team and work out what will work smoothly together. The gardens themselves are never the same. Like with Spelunky, Deathgarden has procedurally generated arenas. So you can’t really plan ahead as much as you want. This garden can simulate a whole forest. Some matches can have fog, others have rain, others be daytime while other matches can be at night. Let’s not forget the bloodpost. Basically the hunter can send a Runner to a bloodpost if he has enough bloodpost charges. Each time the Hunter downs a Runner, he gets a charge. Charges can be stacked. Once you have three then a bloodpost can be used in order to execute a Runner. Runners can save other runners from a bloodpost but they are revealed to the Hunter while they are rescuing. If a Runner is rescued, then the bloodpost loses three charges. So the game has some mercy for Runners. We checked out some gameplay and it is looking good so far. The runners moved how we thought they could. They can jump, scale any surface and scatter like rats. The Hunter is real fast, powerful, jumps high, strong weapons and a real threat. You truly can’t kill the Hunter. The Runners need to look out for crates with provide ammo and also weapon upgrade parts. There are some discussions concerning the balance of the game. The Hunter does seem really strong right now.. we do like that Runners capturing an objective are revealed to the Hunter. It definitely looks better than Dead by Daylight right now. You can’t just run around that same block and the Hunter can never catch them. No! The Hunter will kill you if you try running around a big rock thinking you are safe. The Hunter is faster. 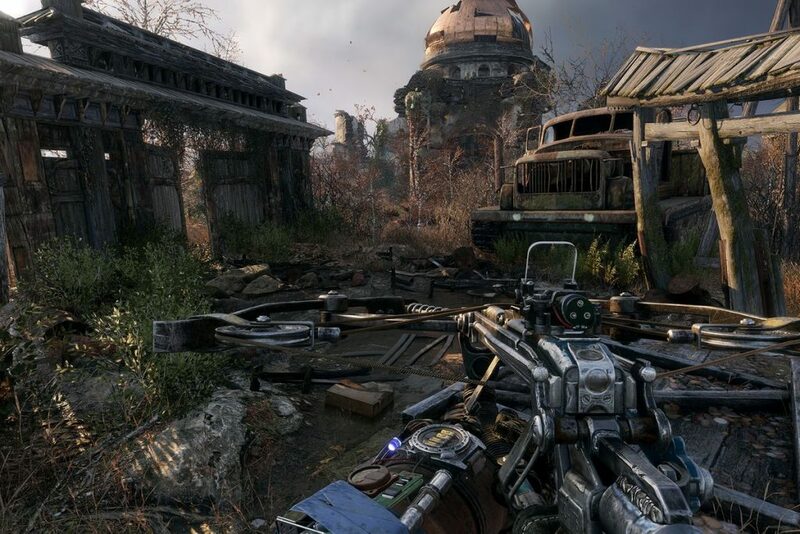 Metro Exodus is the new action adventure game developed by ‘4A Games‘ but published by ‘Deep Silver‘. It is coming out the 22nd of February 2019 on the Xbox One, PS4 and PC. 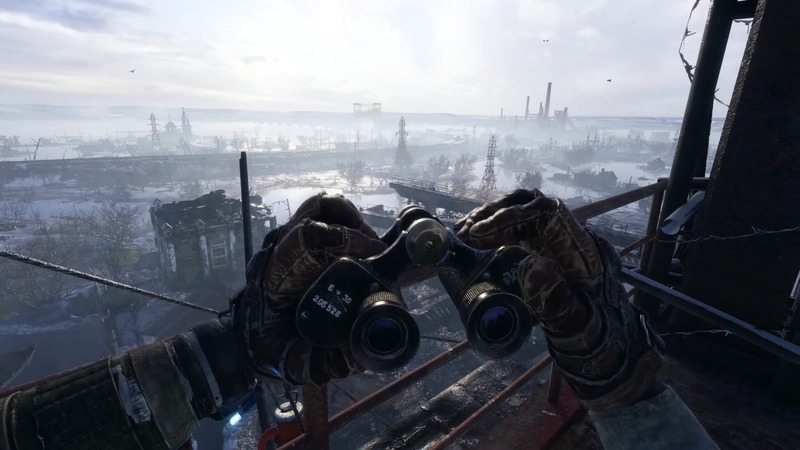 The Metro Exodus world is said to be very immersive and have some survival features. The game is more like an open sandbox. Players have more options now than the previous Metro games. Exploration is needed as there are both linear and non linear objectives. So basically side quests. Thanks to the nuclear wars in the past, players will have to survive and fight through a completely ruined country. Stealth is still a factor in this game. There are times when running and gunning may just get you killed. Especially with the type of enemies that’s running around. What’s also different is that Artyom will be leading a team this time. They are called the spartan rangers. Now from what we know, players will need to be careful as you can lose people permanently. There are a number of characters in Metro Exodus like Anna, who is the best sniper of the spartan order. Duke, who is the youngest of the spartan rangers and most eager. Miller, who is the commander of the aurora and quite militant. Alyosha is basically the scout and survival expert. Tokarev, is basically the tech guy in terms of building weapons and maintenance. There are more characters out there so players should look forward to learning about them. A game like Metro Exodus and it’s world needs a variety of weapons and so far there is a couple. 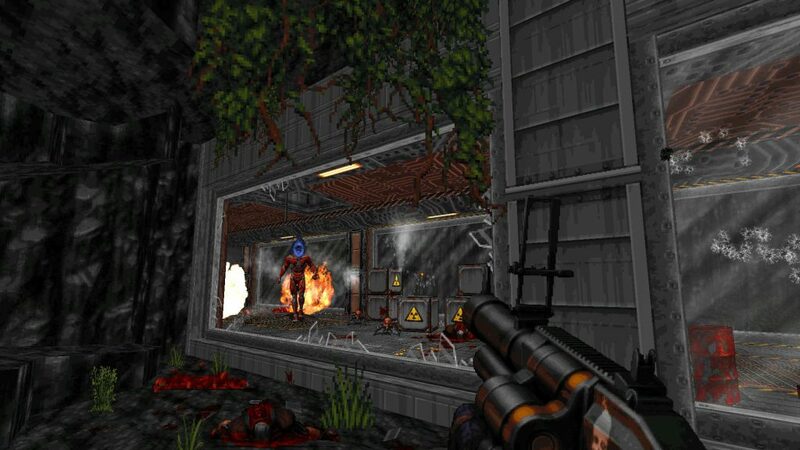 There is the Shambler shot gun which is basically an unstable shotgun that has way more firepower. The Tikhar is basically a sniper rifle that uses ball bearings but with the right tuning can use incendiary rounds. The Helsing which stands out from other weapons is basically the stealth crossbow which can also fire explosive arrows (because why not?). There are more weapons and we hope so as big games like this with big worlds need a lot of weapons and variety. Lastly let’s look at the enemies. There are human enemies who are divided by factions like the children of the forest who have their own lore. Basically they are a group of children who got stranded at a scout camp because of the war. Their camp teacher is their leader and they learnt how to survive and adapt in the wilderness of Moscow. It makes you wonder about the other factions that are around. Also if you though human enemies were the only thing to worry about then you are dead wrong. There are wolves too and these wolves are vicious and one by itself is said to be a threat if not careful so imagine what happens when a pack comes along. Oh there are bears by the way and they should be avoided. But wait… there’s more! There are also mutants. You now the whole nuclear chemical make mutants thing. Metro Exodus has some. Shrimps are mutated crustaceans who hang out near water. The females hang out in groups in the water and can spit corrosive mucus while the males travel solo, have more armour on their legs, can block incoming fire and crush you in melee fashion. The Demon is basically a large flying beast who can pick up any enemy it wants with it’s great strength. It can off course fly around, attack dealing heavy damage, pick you up and ruin your whole life. The metro residents have even described The Demon as one of the deadliest creatures around. It has been advised to avoid fighting this thing. The Humanimal are creatures that have come from real humans. They function and act like apes (apparently) being able to use rocks and wood like weapons. They also can be found in groups and if you make noise, they get aggressive and come for you (you could have guessed that). The Nosalis are like giant rats but worse off course. They are agile and very fast. They can even run along walls and ceilings to get to you. They have nests and are aggressive. They can be found above and below the ground. The Watchman is the most common enemy you will encounter most likely. They travel in packs and have the ability to call for help and reinforcements. We truly hope there are more enemies though. This world has potential to be creative and even scary. We checked out some gameplay and so far it definitely looks clean in terms of how it plays and looks. There is some hint of horror and scares depending on the player. The wolves definitely look good. The game better be difficult and not hold your hand. The graphics and sounds are very good. Hopefully leading a group of spartans doesn’t make things walk in the park. From what we have seen everything looks good so far. 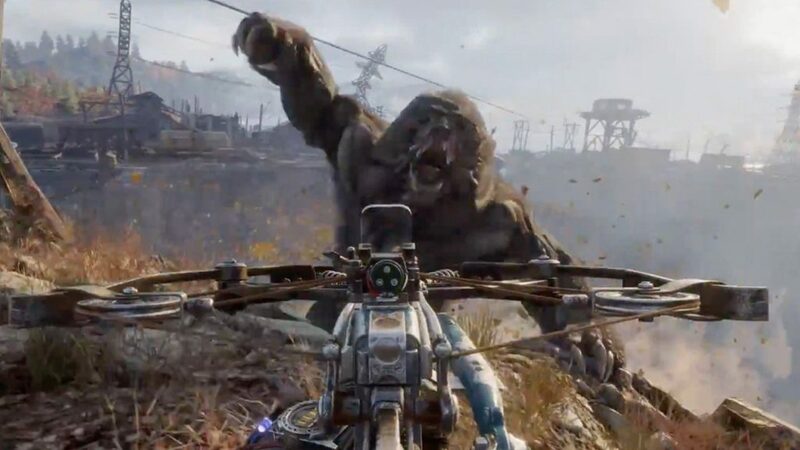 Just wonder how frequent enemy encounters are and how effective and essential is stealth in Metro Exodus. 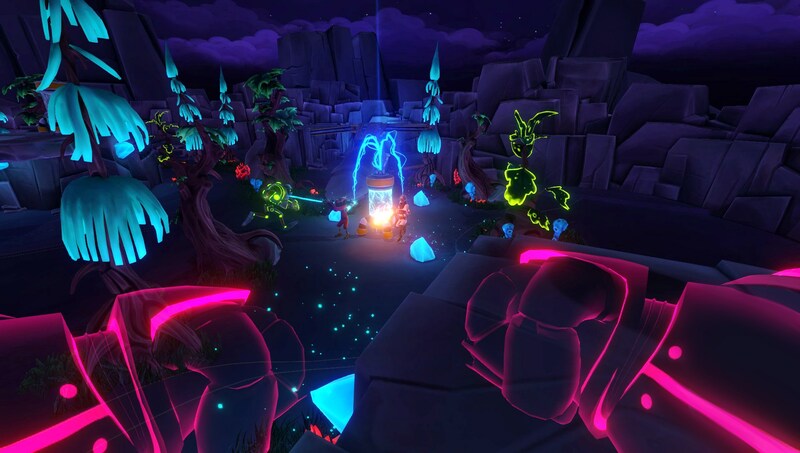 Aftercharge is a online 3v3 competitive shooter game developed by ‘Chainsawesome Games‘. It is coming out… well that’s the thing. some say later this year but steam says January 2019. So it’s up to you to personally track that information yourself over time. It’s coming out on Xbox One, Nintendo Switch and PC. Let’s take a look. Now let’s start with the Aftercharge story… there isn’t one… really. basically what we do know is that there are invisible robots who want to destroy some glowing extractors but said extractors are being guarded by invincible security squads. So invisible robots vs invincible troops. As mentioned before, this is all 3v3 competitive. 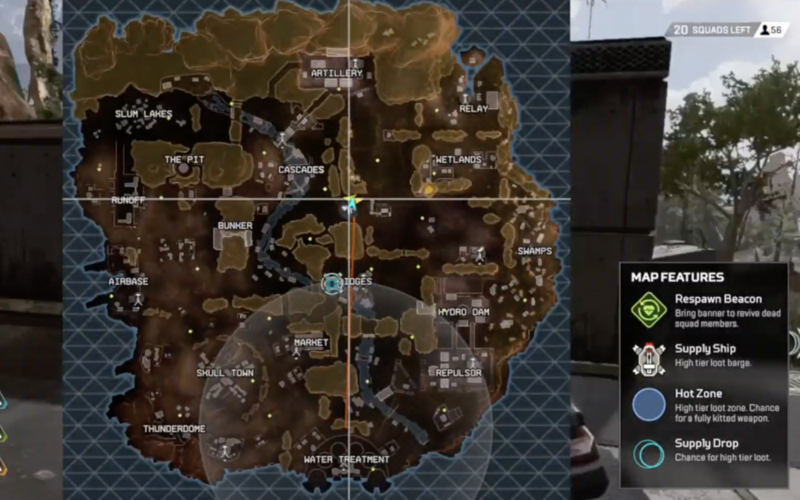 The maps in Aftercharge are small like the teams so the action is always happening and rounds are short which is good for these things. 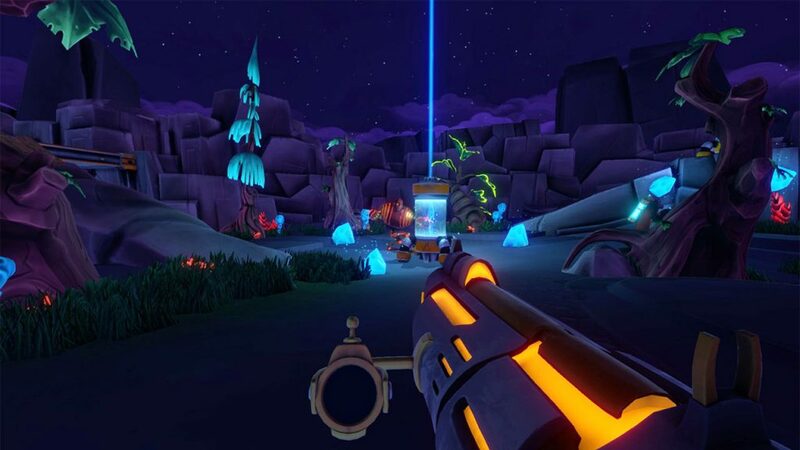 In Aftercharge, the invincible security team don’t have to worry as they can’t die but need to spot the invisible attackers and take them out to protect the extractors. The robots need to be real clever. They sneak to sneak around the security members, maybe cause a distraction or two and off course work together. Being invincible is over powered off course so to balance it out, not only are the robots invisible but they also can revive allies as much as they want and there are no cool downs to abilities. What? Abilities? Oh yeah. Both teams have abilities and a character pool. Each of the characters have very different abilities from each other. Already this is sounding cool. We checked out some Aftercharge gameplay and learnt a lot. Robots can attack security to knock them away, throw distractions, stun, thruster jump, out up a bubble shield and more. 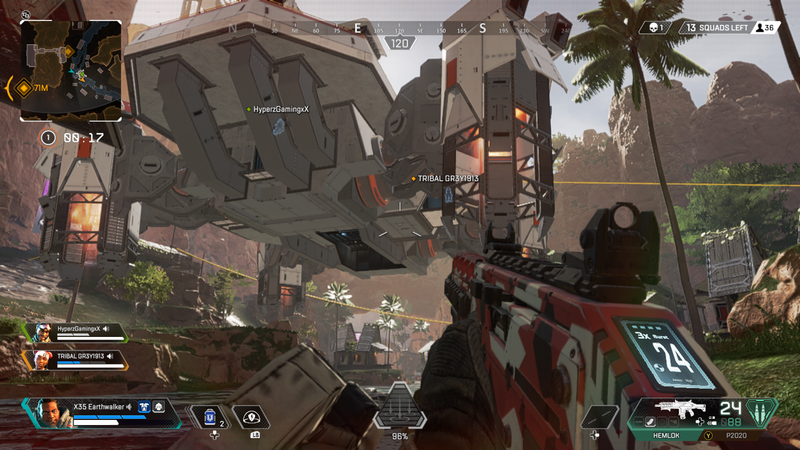 The security can put up shield gates to block entry, a scanning device to find invisible enemies, a exposing grenade to reveal robots, traps like mines and disablers and off course more. It definitely sounds chaotic. There is a lot going on. 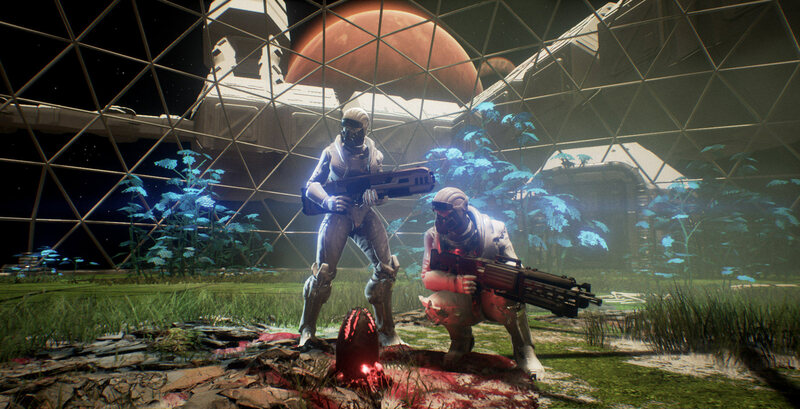 Genesis Alpha One is a new sci-fi first person shooter game developed by ‘Radiation Blue‘ but published by ‘Team17‘. Genesis Alpha One is coming out the 4th of September on Xbox One, PS4 and PC. 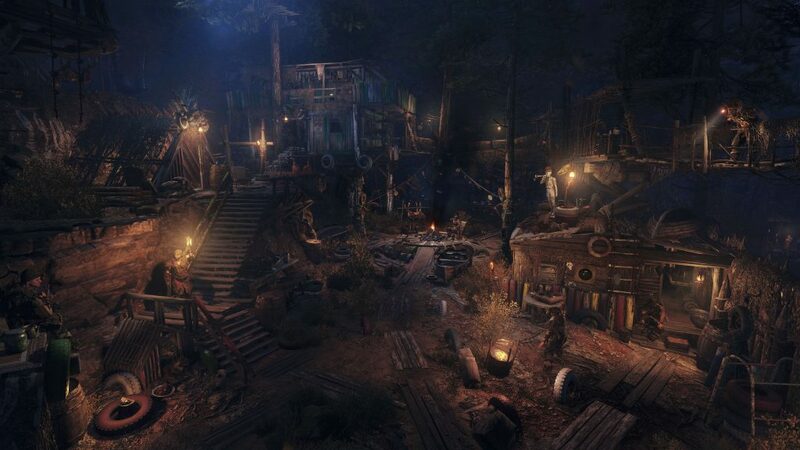 Survival games can get real deep and we hope this one is done very well. The story in Genesis Alpha One is basically, humanity is in a bad state thanks to many wars, very bad pollution and off course corrupt regimes. We all know it’s never complete without corruption. So 4 powerful or should we say influential corporations have started the Genesis program. Players control the captain of the Genesis starship. It is your duty to make sure everything goes smoothly and to make the right decisions. So time for the survival stuff. In Genesis Alpha One, players will have to explore a really large universe. It’s never that simple. 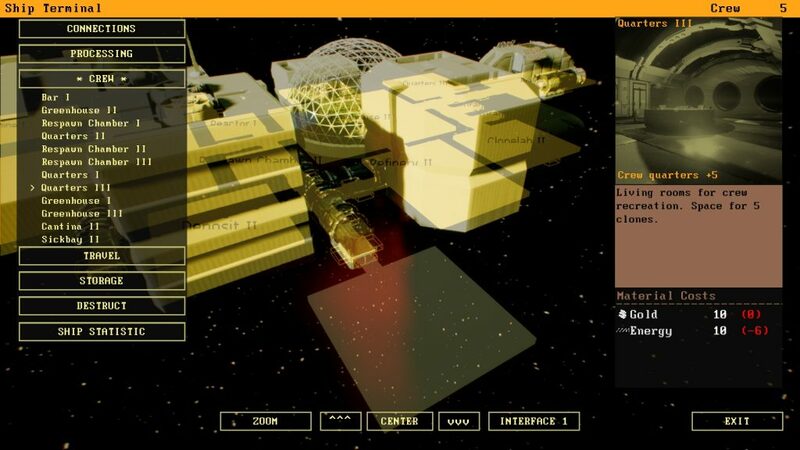 You will also need to collection and manage resources, build and manage a space vessel. If you can do all of this then completing the main mission is possible. What’s the mission? It’s simply finding new homes for humanities DNA and off course saving humanity from extinction. Off course things aren’t that simple either. There are aliens around and boy are they hostile. some are even described as terrifying. Worse are alien infestations which off course have to be cleared out and handled, if that’s even possible. This means combat is a big part of the game as well. 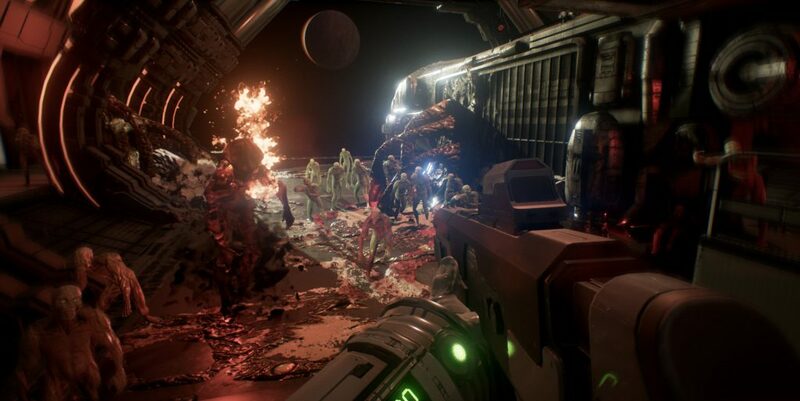 Genesis Alpha One is a first person shooter after all. 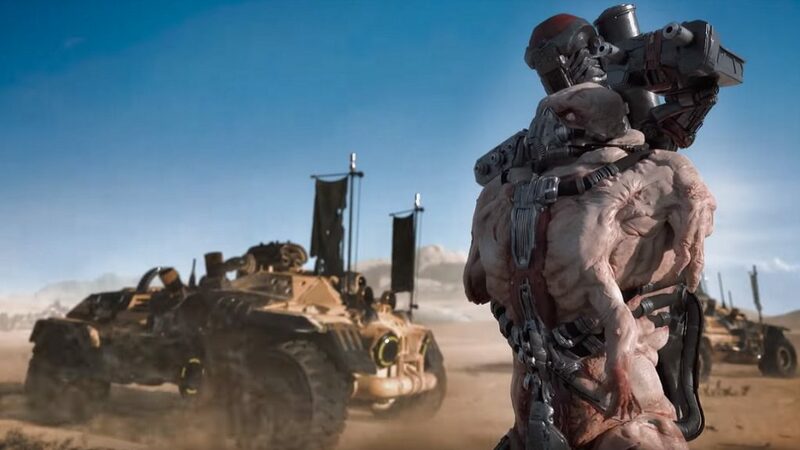 Not much information is given about the aliens but some look like taller Juvies from Gears of war 4. There are some tentacle big mouth punching enemies and another that sort of look like a combination of head crabs with the main aliens from Star Ship Troopers. Scary right? Not only that, technology is really advanced as you can clone things like creatures and even your own troops. There is permanent death in Genesis Alpha One which means every troop in your team matters. If they die, they stay dead. Every decision you make as captain matters. Sort of like with XCOM 2: War of the Chosen. Not only that, it gets worse. It’s all random generated. So every time you journey into Genesis Alpha One, you will get a different galaxy loaded with dangers and things to do. It won’t be the same. We checked out some gameplay. There is a lot of decisions to be made in how you approach things, whether it’s to set up defences like turrets, is it safe to search the alien bodies for DNA samples? Stuff like that. You also have to keep an look out for infestations which look like small fungus growth. If left unattended then expect a whole lot of trouble. Manage and have enough plants in your green house to keep everyone alive. There is lots going on and we like it. There is customisation as well. For example if you build a quarters for your crew members you can change the colour of the sofa and other individual objects. Glad to see that you can see what resources can be found on each planet. 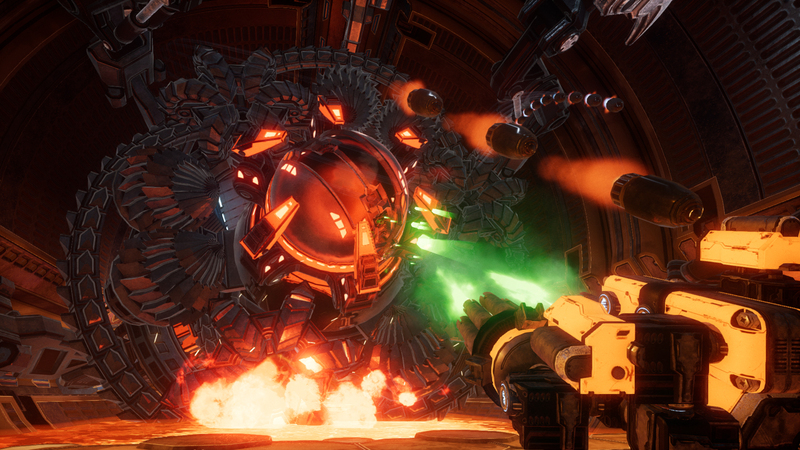 Mothergunship is a new first person shooter bullet-hell developed by ‘Grip Digital‘. It will be coming out the 17th of July on the Xbox One, PS4 and PC. 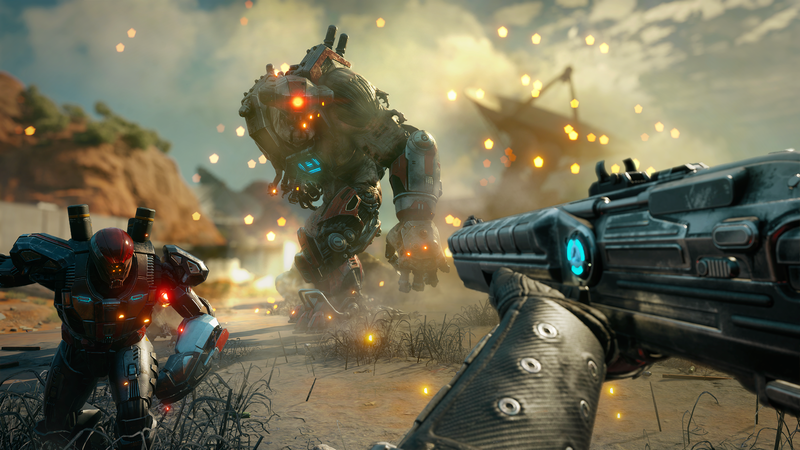 Mothergunship is serious about making a big mark in the gaming world. Lots of bullets and big problems. Let’s take a look. 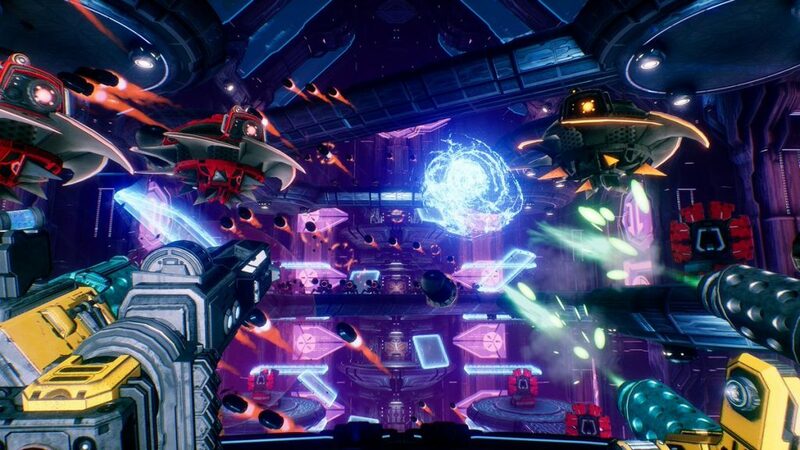 Mothergunship has been described as a bullet hell so you know it’s going to be intense and something serious. Not only that it’s a bullet hell first person shooter which is crazy in itself. Players must face off against and defeat an robotic alien armada that has already conquered earth. To do this players must craft their own weapons, which have been described as over the top. 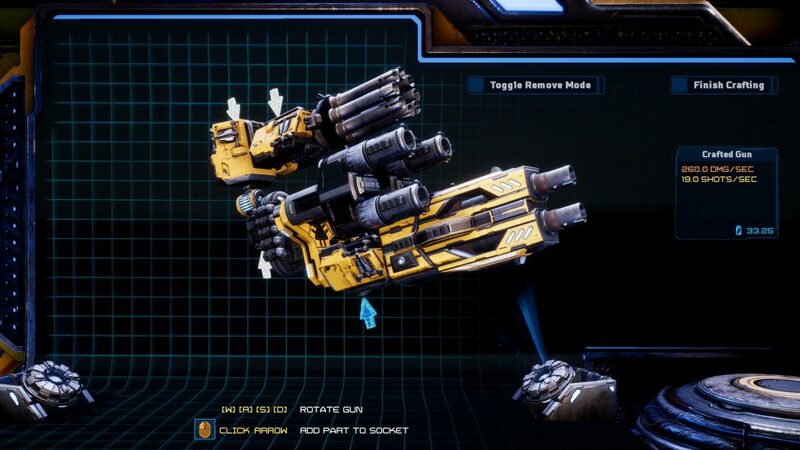 The developers description says it has “one of the largest gun customisation options seen in video games”. This is a big claim indeed. The guns that gamers could craft have been described as monstrosities that no reasonable person could ever lift. So expect big weapons. Crafting in Mothergunship is actually very deep. You can make a bunch of things happen. Like even plasma, lasers, cannons, rockets, shotguns, machine guns and much more. We have even seen a multi barrel rocket launcher. It gets crazier than that. Now Mothergunship should make some gamers get a Ultimate Doom feeling or even the latest DOOM. This is because it’s all about mobility, It’s all about movement. If a players stays still they will be dead guaranteed. With so many enemies, attacks and off course projectiles coming your way, you’ll have to keep track of the big enemies and loads of projectiles all at the same time. So keep moving, look for weak spots, dodge enemies, don’t get cornered, and slip through all bullets. Sounds simple right? We believe that players will have a great time in building their weapons. The ideas are pretty much endless. Use connectors, barrels and caps to make any combination really. There are even these attachments by the look of it to add effects like increasing criticl chance. The ultimate goal is off course to fight your way towards the Mothergunship which is where things get real crazy.It’s all random generated levels too so don’t think you can plan for the next area. Just be ready for anything. We checked out some Mothergunship gameplay and it’s what we thought it would be mostly. There are many enemies with some variety, many threats, lots of bullets etc. we honestly though it would be more chaotic but maybe that’s the case further in the game to the point where it could be described as unfair. We hope so. The different weapons are very cool indeed. The bosses so far haven’t impressed us yet. We hope to see more of them to get a better understanding of them. 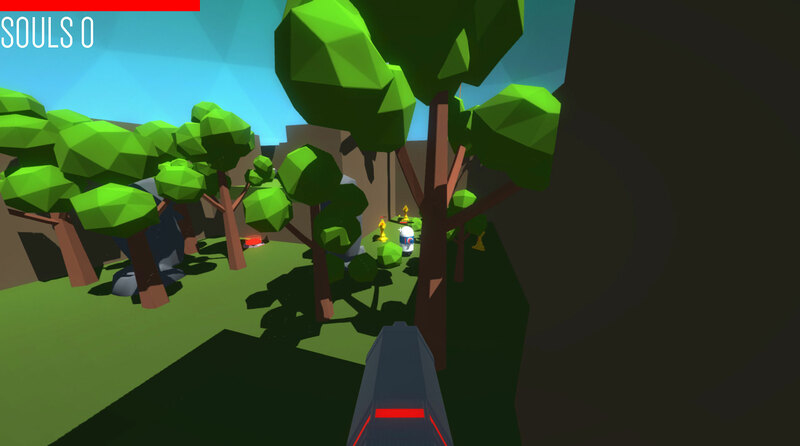 Polygod is a new randomly generated first person shooter game developed by ‘Amplify games‘. It is coming out later this quarter of the year on the Xbox One, Nintendo Switch and PC but early access is already available, so check Steam for more information. Random generated games are serious business. Let’s take a look. In Polygod players control a assassin only known as ‘Faceless the blessed’. You are taking part in a special event called the ‘Trials of the Gods’. Here you must battle the minions of the malignant gods. If that wasn’t enough, you must also take on the holy champions. Now straight away you know this game is going to be crazy in terms of the action. The concept is nothing new but it’s a good one that action gamers will already have a certain level on interest in. Now the levels are all randomly generated and that word is a scary word. We at X35 Earthwalker are Spelunker masters and have experienced the wrath and unpredictable-ness of randomly generated levels. This means that Polygod is something gamers can’t plan for. speed runs become that much harder and nothing stays the same. In every level there is an successive altar of worship which you can use to exchange souls you collect for blessings which are power ups. This is cool so every level you have something to look forward too. So basically you are also getting more powerful all the time, which makes sense since you technically are facing the gods. In case you were wondering you get souls by killing the minions. Since there are a lot of them, you will rack up souls in no time. Also there is permanent death, otherwise the game would be easy. So after each death you start again and will have a whole new experience since no level is the same. We hope so though. 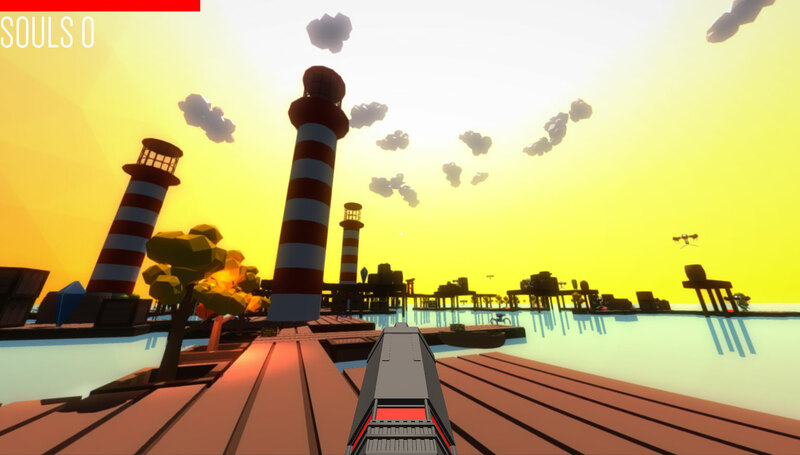 Polygod has got an ace up their sleeve to make them stand out from all the other shooters. It’s called ‘Arena Shooter multi-player’. Basically think of free for all slayer matches in Halo but each map is randomly generated. That sounds crazy. No planning for spawn killing, or camping or set ups. Just pure action, adjustments and realistic skill. We like the idea of this. This is definitely new and interesting. We at X35 Earthwalker can imagine fighting each other in situations like that. Pure madness. They plan to evolve it a whole lot more by bringing in game types like capture the flag, they also want to add in altars and blessing s from the main game. Sounds awesome. We checked out some gameplay and it’s sort of what we expected. The smooth movement, polygon looking surroundings and the backgrounds. There are 75 different blessings to acquire and use, 5 unique enemies per level and 5 boss fights. The game doesn’t sound big but maybe the size comes from the amount of levels. it looks great, runs great and the level designs are interesting. The enemies don’t come off as impressive at all. They seem more generic and something players won’t take too seriously in combat.